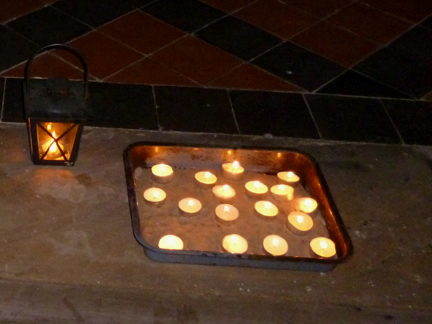 We used candles as part of an all age service on the theme of light. 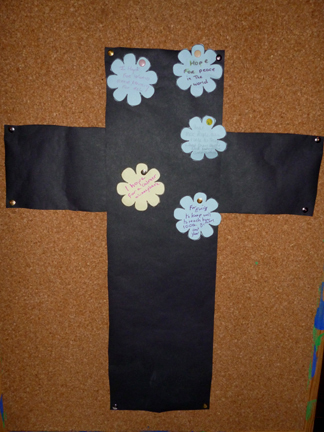 We had put several written prayers relating to light on a board (including simple ones that could be read by or read to children) and we suggested that people might like to read one of the prayers and then light a candle. "Is it possible for Christians to walk together with each other, despite their differences?" We asked people to think about this and then draw round one of their feet. They were then asked to find someone else in the church and draw round one of their feet. The feet were then cut out and decorated and placed on the road leading to the cross. 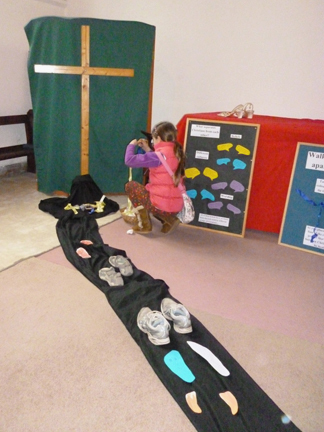 The theme of this all age service in the week of Christian Unity was "Act justly, love mercy, and walk humbly with our God". 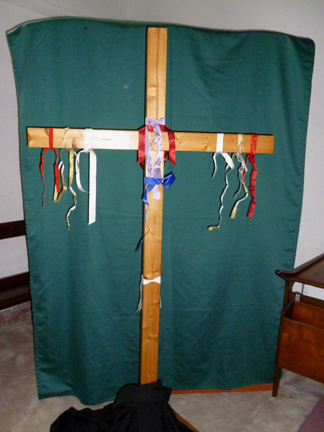 People were asked to say a prayer for Christian unity and then to choose two different coloured ribbons and tie them to the cross as a symbol of their prayer. 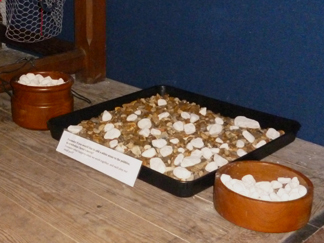 At this prayer station, people were asked to reflect on themselves as a whole person. The question asked was: "When did you last do something physical, something creative, something using your mind, something creative, something with your hands?" 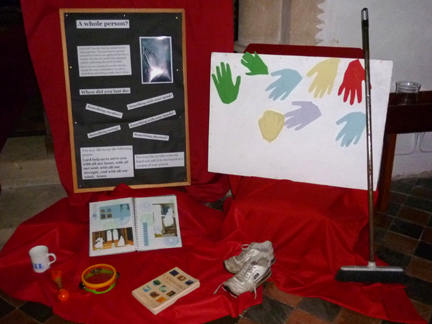 The display included a scrapbook, running shoes, a book, a mug and a broom! "Lord help us to serve you with all our heart, all our soul all our strength and all our mind. Amen" and to place a cut out hand on the board as a symbol of their prayer. 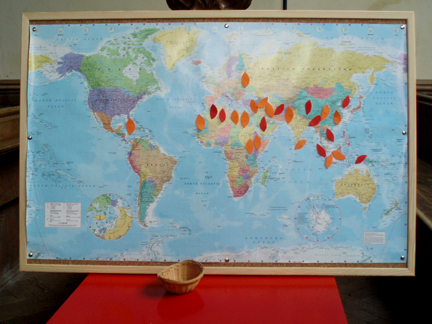 This world map has been used many times to pray for other countries. Here it was used to pray for countries where Christians are persecuted. 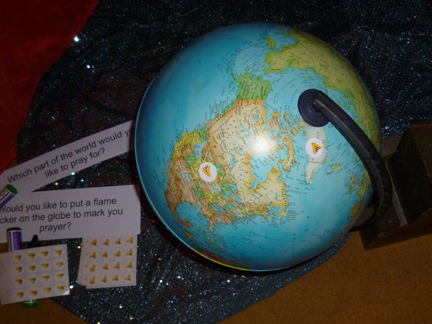 Children and adults were asked to place a flame on the map as a symbol of their prayers. A globe was used to help people pray for other countries: "Which part of the world would you like to pray for? Would you like to put a flame sticker on the globe to mark your prayer?" Making a cross out of nails, while remembering the nail crosses sent out across the world from Coventry Cathedral as a sign of hope or nailing a flower prayer of hope to the outlined cross. The picture in the centre was designed by John Piper for the Baptistery in Coventry Cathedral to show light breaking through the darkness. People were invited to respond by tearing black paper and sticking it to the yellow background to think about Jesus's death on the cross. 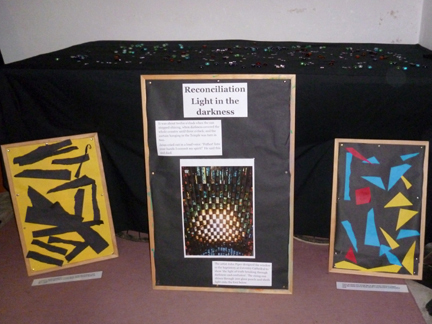 They were then asked to add coloured paper to the black background to symbolise the light overcoming the dark. 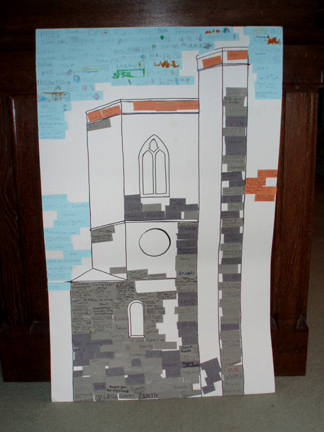 This was used as part of our church's 750th anniversary celebrations.